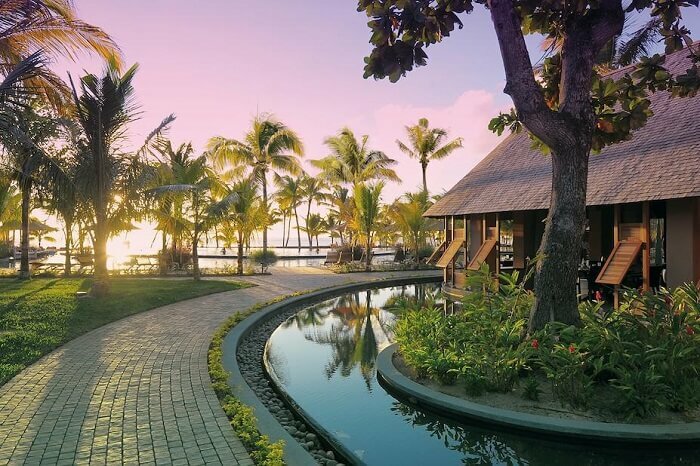 Trou aux Biches Beachcomber Golf Resort & Spa is one of the hottest 5-star hotels in the world which offers world-class accommodation and services. Located on the north-west of Mauritius, the hotel also houses a private beach and is well known for its serene beauty, friendly people, and delicious cuisine. This luxury hotel in Mauritius is a treat for couples and honeymooners with its alluring sunsets and palm grove villas. With all the luxurious and beautiful tropical gardens, Trou aux Biches Beachcomber serves as the best romantic destination. The Trou aux Biches Beachcomber hotel offers access to Mont Choisy Golf Course and also offers other water activities like glass-bottom boat excursions and water-skiing which will give a thrilling experience to the guests. 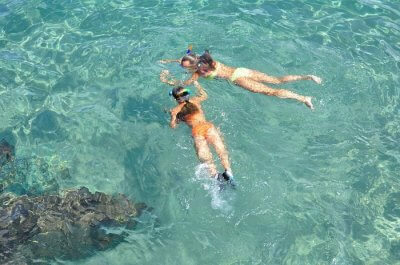 There are numerous activities that will help enjoy the calm waters inside the reef. The hotel also gives luxury like never before with its exclusive accommodation. To add to the commendable service, the hotel Trou aux Biches beachcomber comes with an air-conditioned accommodation with a furnished balcony or terrace. Trou-aux-Biches was awarded the world’s leading beach destination by the World Travel Group in 2011. Trou aux Biches Beachcomber Golf Resort & Spa is one of the leading destinations in Mauritius. The eco-friendly hotel is filled with tropical colors and beautiful beachfront suites. Room services are available all day and there are plenty of activities like fishing, cycling, diving, canoeing to keep the guests happy and content. Private golf area, outdoor swimming pool, fitness center are available. Facilities like room service, concierge, dry cleaning are also available. Babysitting service can also be availed on request. The hotel also provides free airport transfers from and to the hotel. The tropical style Trou aux Biches Beachcomber Golf Resort & Spa gives various options to explore. It offers six widest choices of restaurants in Mauritius namely L’Oasis Restaurant that offers International Buffet, La Caravelle Restaurant that delights in International cuisines, dine on Mediterranean cuisines at the Le Deck Restaurant, savor Thai cuisine at the Blue Ginger Restaurant. The Mahiya Restaurant offers authentic Indian food. Irresistible flavors of Italian cuisine are served at II Corallo Restaurant. The hotel also has 2 bars namely the Oasis Bar and the Caravelle Bar. These multi-cuisine restaurants will take one on a culinary journey from Europe to Asia. Trou aux Biches Beachcomber Golf Resort & Spa aims in helping the guests find inner peace and experience the true meaning of wellness. Guests can choose suites and villas of their choice which comes along with splendid features. The impeccable service and hospitality are sure to make one’s stay in Mauritius a paradise. At the Trou aux Biches Beachcomber Golf Resort & Spa, travelers get to choose from a variety of suites and villas. The wooden furniture has a sophisticated look. The bedroom opens into a cozy lounge area and terrace. All suites are set in a quiet corner and have access to a private pool. The suites and rooms enjoy views of lush green gardens and a pool in the center. The bedrooms are spacious with exotic accessories. Q1. What are some of the best sightseeing places near Trou aux Biches? A. The best places to visit near Trou aux Biches Beachcomber Golf Resort & Spa include the Pamplemousses Garden and the photography museum of Mauritius. Q2. What are the different activities that one can indulge in? 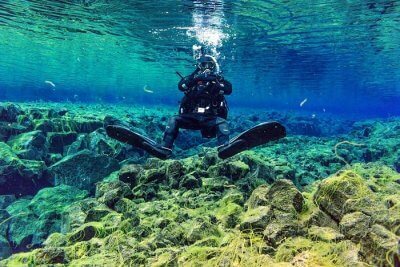 A. Trou aux Biches is the best place to go underwater sightseeing. 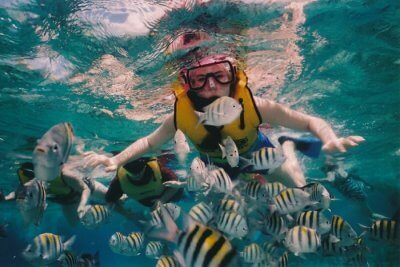 The secured environment also allows children to experience the underwater beauty. 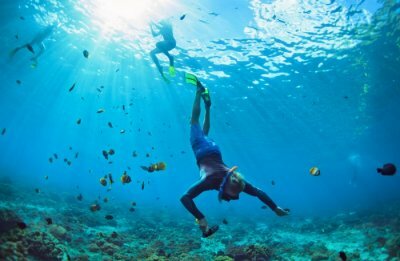 Apart from this other activities include snorkeling, sailing and deep diving. Q3. Does the hotel provide a flexible check-in? A. Yes, the hotel provides a flexible check-in and is open 24 hours. Q4. Why is Beachcomber Golf Resort & Spa recommended for honeymooners? A. The tropical gardens, private pools, cozy accommodation, spa, and other sports activities are sure to make the stay pleasant and memorable. Q5. Does the hotel provide a private chef? A. Trou aux Biches Beachcomber Golf Resort & Spa is well known for its diversity in culinary. It also provides a private chef if requested. Located on one of the most beautiful beaches in the world, the Trou aux Biches Beachcomber Golf Resort & Spa is a dream honeymoon destination. 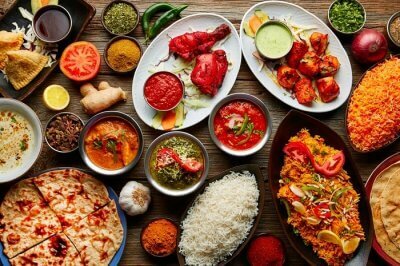 Mauritius is also the best place to test one’s appetite and explore cuisines from different parts of the world. Apart from the food, it is also the best place to explore the underworld and get closer to nature. Kids too can have the time for their life by indulging in activities like swimming, horse riding, and rock climbing. Trou aux Biches Beachcomber so vies for keeping the environment clean and safe. The ancient trees are still kept intact around the resort which adds more beauty to the alluring island. So if one is planning for a peaceful and memorable trip, Trou aux Biches Beachcomber Golf & Spa is the ideal place.